Pápai Páriz Ferenc, Album amicorum p. 431. Eruditissimo viro Dom[ino] Possessori haec pauca in sui memoriam adscripsit. In Franeker, on September 19, 1719. Pierre Latané was born in Pont-à-Mousson at Moselle on February 2, 1658, in a distinguished family, the son of the justice of the peace Jozef Latané, and grandson of the Protestant teacher Petrus Latané. He studied in the high school of Bordeaux, then from 1675 in Montpellier with the renowned physician Charles de Barbeyrac (1629-1699) and from 1679 with Nicolas Lemery (1645-1715) in Paris. At the outbreak of the persecution of Protestants following the revocation of the Edict of Nantes, he fled from his native town and practised in Leeuwarden. From 1689 he lectured at the university of Franeker, in 1691 he was appointed extraordinary professor, in 1693 ordinary professor, and in 1701 also professor of botany. From 1712 he was court physician of the Prince. He died on July 16, 1726. 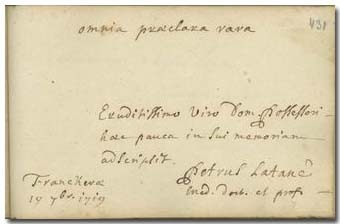 Two Hungarian students of him wrote funeral poems at his death, one of them was the physician and pastor Pál Keresztesi (?-1734): Threnodia in obitum P. Latane. Franeker, 1726. – Latané was a successful physician: “clinicorum in nostra Frisia facile princeps,” as well as a great humanist, and a doctor of the poor. He recognised the nature of the Frisian autumn fever, and successfully proposed quinine for its treatment. His inaugural address was published: Oratio inauguralis de officio medici. Franeker, 1693. The above mentioned Pál Keresztesi also wrote a funeral poem at the death of Campegius Vitringa, Jun. Vitringa wrote one day earlier than Latané in the album of Pápai Páriz. (p. 125). Keresztesi defended his dissertation under the chairmanship of Ruardus ab Andala (p. 129): Dissertationis medico-theologicae pars prior de utilitate … medicinae … Franeker, 1725.